Everybody’s pretty much convinced that the 2020 Ford Bronco will be the retro-looking 4x4 enthusiasts are hoping for, complete with a removable roof and doors. Some Ford patent images making the rounds right now could be taken as further evidence of that, and the design is actually exceptionally clever. Or at least some version of that phrase–the patent filing is in German, so I’m relying on Google Translate to interpret it. But the patent does include a lot of pictures, in which it seems that this door concept is modular and multi-modal. Put more plainly: the vehicle would have its regular door, but inside them would be a tube-frame style skeletal door. So you could either drive around with full doors, or pull the skins off and have tube doors, or pull the whole deal off and go naked. The Jeep Wrangler has optional tube-frame doors too, but they’re completely separate from the standard doors. Integrating both together seems like a very cool and clever solution. I reached out to Ford to ask about this, but the company’s spokespeople avoided committal statements. “We submit patents on new inventions as a normal course of business but they aren’t necessarily an indication of new business or product plans,” Ford Communications Manager Mike Levine told me in an email. Smartly, they’re reserving the right to write this off as just an idea. And of course, yes, just because a company patents something does not mean they will build it. So the “Might” is a key word in the headline of this story. So if this technology goes into production, and if it made its way onto the 2020 Ford Bronco, I think the SUV’s door situation could be cooler than what Jeep is working with right now. Similarly, I wouldn’t bother looking too closely at the vehicle silhouette in these drawings; I’m pretty sure that’s just a placeholder and not necessarily indicative of what the new Bronco’s profile will actually look like. That said, the rake of the windshield and door shape does look vaguely similar to the Ford Ranger’s. 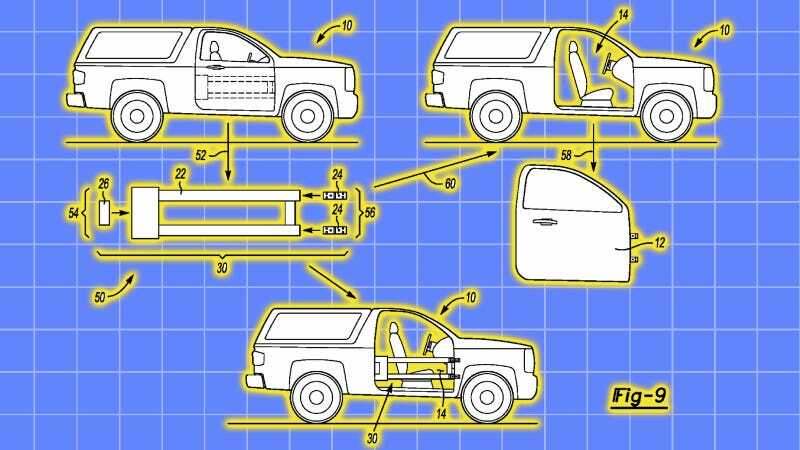 Anyway, modular doors for an off-road SUV like the Bronco really are a great idea, and maybe this and all the other blog posts about these newly discovered patent pictures will help motivate Ford to make this potential function a reality. I followed up by trying to clarify the correctness of my interpretation of the images and have not heard back yet, but I will update this post if the company’s reps add anything else.